So I had a craving, and that craving was for the flavors of a banh mi sandwich. 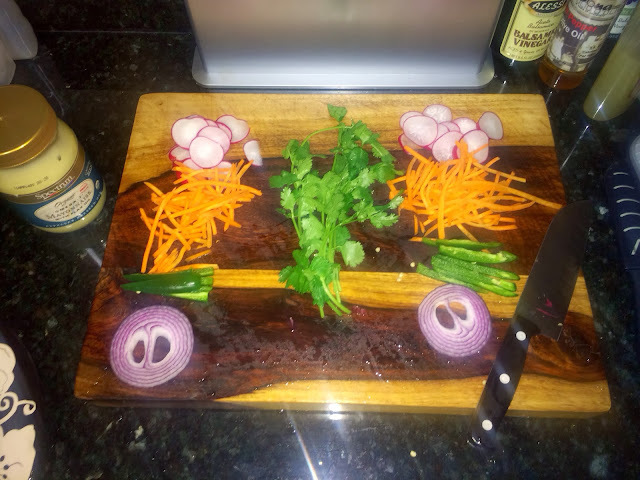 Mainly I love the combination of radish, jalapeño, carrots, onion and cilantro which is at least in the spirit of the traditional tasty Vietnamese creation. I don’t typically get the gluten free breads, but I indulged in some wheat-free ciabatta rolls and decided it was time for a sandwich for dinner! You need to start with a good mise en place, and definitely make that a double if you’re going to make a second sandwich for tomorrow’s lunch! 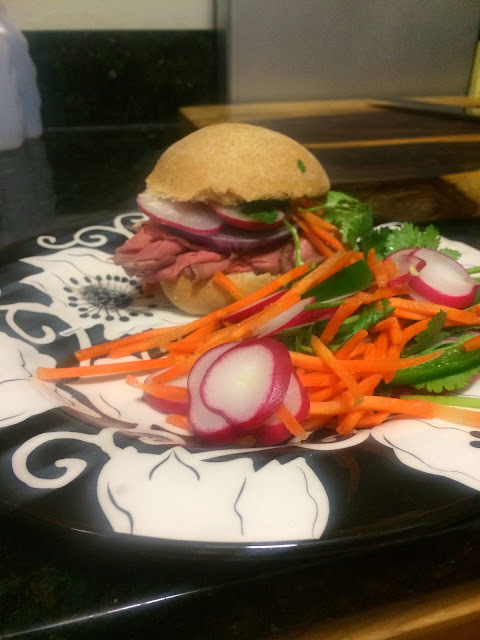 I went for some roast beef for meat and since the rolls are on the smaller side, the extra veggies made for a delicious side salad. The only other thing I added was a little natural mayo and I have to admit, this totally satisfied my craving. I’m already looking forward to lunch tomorrow! Yesterday I also decided to make a soup. I think I started craving chicken soup knowing that I’m at a key time of training and a time to make sure there are no more winter colds! It was super easy but very tasty. 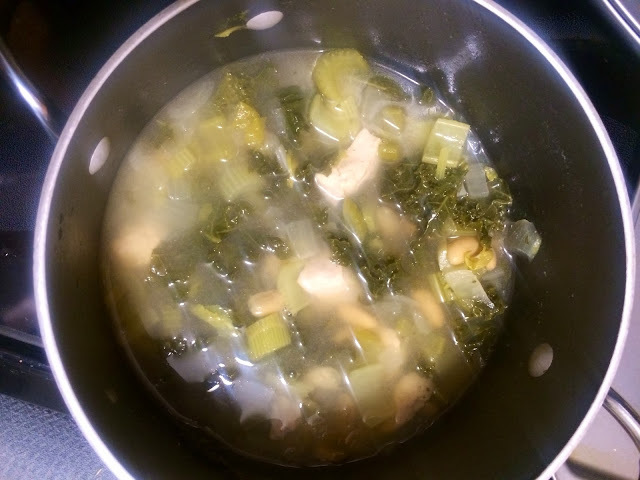 Basically I combined chicken breast, stock, celery, onion, white beans and kale. For a little different “zing” I like lemon juice and dill added in near the end. I had this fordinner yesterday and lunch today. No I also have a few more dinners for the week. It’s hearty but also light tasting at the same time which feels like the perfect combination for this time of year! I didn’t really follow any recipes for either of these, and sometimes that’s when you end up with the tastiest and easiest meals. Both quite healthy too! I have all the fixin’s for another new meal this week, so you might be hearing some more from me about eats very soon.